Disclaimer: No, I didn’t create them and I don’t own them. Notes: My little answer to JeanGenie's challenge to write a story titled Under Pressure and using only two of the M7 characters. I used Vin and, of course, Ezra. One track minded, me? Vin shifted nervously, trying to dispel the ache between his shoulder blades that the tension was causing. His right hand shook slightly, his grip on the Winchester's stock slick in his left. A dull throbbing was making itself known against his left temple, while something sharp seemed to lance its way through his gut. Everything counted on this one shot. A drop of sweat slipped down his forehead to fall onto his right eyelash, then sat there, quivering. Angrily, the tracker shook his head to shake it free, his eyes tightly shut, before roughly rubbing his heated face on the coarse fabric of his left sleeve. The man lying next to him on the outcropping furrowed his brow, his own grip on his rifle loose and calm. "What are you worried about?" Ezra asked, the soft southern tone a mix of curiosity and concern. "I don't rightly know," Vin whispered back shakily, letting go with his right hand and wiping it on the side of his buckskin trousers. "You've done this hundreds of times," Ezra told him, squinting his green eyes to peer in the same direction as the tracker. The rocks in the dry gully below were empty of anything save brush and brambles. The path they were watching was quiet. "Sure I have," Vin retorted sharply, "I shoot my best friend all the time." Ezra sighed, "He trusts you, Vin. He knows how good you are." Vin grunted in response. He knew that Ezra was trying, but the words were shallow compared to what he needed to hear. The gambler knew this, but, at the moment, found himself at a loss for words. It was strange feeling, Ezra thought wryly. "This was a rotten idea," Vin said finally, shifting again to find a more stable position on the ground. A rock ground its way into his abdomen, and he had to let go of the rifle again to knock it away. "It was a good idea, Vin. It will extricate our leader effectively without alerting the villains of his double dealings." The tracker's head fell, his forehead touching the ground in front of him. Ezra pretended not to notice the man's exasperated sigh at his somewhat verbose statement. "What I mean to say, Mr. Tanner, is that if we do not do this, then, in a few hours, the cavalry will ride in and Chris will be exposed as a traitor. The leaders of this band won’t just let a thing like that go, even from jail. Chris would be as good as dead anyway." Vin’s head shot up at the last word – anyway..
"Anyway? What do you mean anyway? You think I'm gonna miss?" Ezra shut his eyes, swearing at his stupidity. Swallowing, he opened his eyes and put as much of his training as possible to make the next sentence believable. "Vin, no, of course not. You are undeniably the best sharpshooter I have ever had the opportunity to witness, and this includes the large number of contests and fairs that I've taken part in as a gaming man." It didn't work. Vin just glared at him, then turned his attention back to the rocks. Ezra mentally slapped himself. It was not that he had lied, but he realized too late that he had presented it to Vin as if it were a lie. The sharpshooter had only seen the veneer, not the heart. "Vin," Ezra licked his lips, "Look, I've seen you knock men off their horses from distances far greater than this without breaking a sweat. What is so different about this? I mean, besides who the target is?" The tracker shrugged, sighting down the barrel for possibly the twelfth time in as many seconds. "When I shoot from this distance," he began quietly, "I normally aim for the center of the chest. Now, I always hit the man, but I hit the gut, arms, legs and neck as often as I hit the center. If I'm just trying to bring the man down, I'm not too choosy, you understand? But I have to hit Chris in the arm, have to knock him off just right to make it seem like I killed him. From this distance, that level of accuracy...."
"Is a piece of cake," Ezra smiled disarmingly. "Would you rather I shoot Chris, while you distract the others?" Vin's eyes widened as he looked at him, "Hell no! Are you joking?" The gambler looked properly surprised, "You have so little faith in my...?" "Yes, I do," Vin interrupted quickly. "You're good close range, Ez, real good, but you're not as consistent long range." "Ah," Ezra nodded slowly, and dug his elbows more into the dirt, "I see." He turned away from Vin, his mouth set in a firm line. Vin frowned, "Now, don't take it like that. Damn Ez, you gotta know your limits. You're fast, as fast as Chris almost, and a hell of a lot faster than me, but your accuracy needs work when shooting from a distance of more than a few yards. It's not your fault...you're a pistol man, that's all." "A pistol man...really," the southerner's tone had darkened. Vin huffed. "Christ, Ezra, don't take this so much to heart. Listen, when we get back, I'll help you work on your distance shots, okay?" Ezra looked askance at the tracker, "You sure?" "Yeah. Chris has a good place for target practice up at his place. I've seen Buck practicing there lots of times." "Speaking of Chris..." Ezra's eyes narrowed and he sighted down his rifle to draw a bead on the first set of outlaws as they rounded the corner several hundred feet below his and Vin's position. The tracker's eyes widened, amazed that he had momentarily forgotten what they were doing lying up on this outcropping. Without time to think, he pulled his rifle close and sighted expertly down the barrel, waiting for the sight of a black hat and duster to make their appearance. 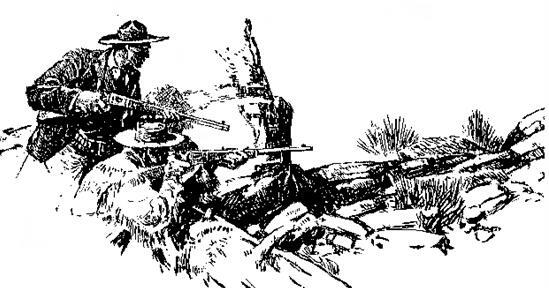 Half a second later, the cracking of rifle fire exploded through the gully below, scattering the outlaws on their horses, and knocking one in particular off his horse to play "dead." The flash of a pained smile from beneath the black hat told the men up on high that Vin had, as usual, done his job flawlessly. As the outlaws retreated quickly away from the ambush, Ezra glanced across at the tracker and grinned. "Thanks," Vin said sheepishly, a crooked smile on his face as he caught the glance. "Pistol man indeed," Ezra rejoined with an exaggerated sigh, bringing a hand to tap his chest. "Oh, the indignity!" The picture is an old woodcut. I hope it comes out.